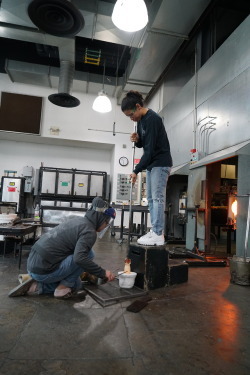 After the introduction of primary colored opalware post-World War II, new Pyrex colors (and later prints) poured out of Corning Glass Works for the next four decades. 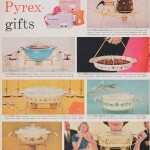 The 1950s saw the introduction of colorful patterns and new shapes, and specialty dishes for entertaining. Some would become standards produced for multiple years, while others were seasonal promotional items with a limited run. 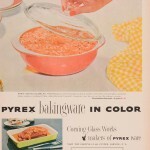 1952 Lime and Flamingo Pink joined the Pyrex Primary Colors. 1953 Dinnerware with colored rims in Lime, Flamingo Pink, Turquoise, and Dove Gray debuted. 1955 Speckled yellow and pink, called Desert Dawn was released. 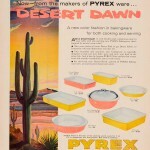 1956 Pastel yellow, pink, and turquoise joined the solid color bakeware. 1956 The first screen-printed patterns debuted in Pink Daisy and Snowflake, which came in white on turquoise, turquoise on white, and white on charcoal. 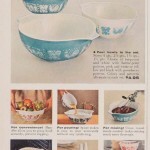 1957 New patterns were added to the standard line named Butterprint and Gooseberry. These patterns were the first to be available in both the traditional style bowls as well as the new Cinderella style, which had a handle on one side and a spout on the other. 1957-1959 Promotional gift set patterns were released in Black Tulip, Scroll, Bluebird, and Golden. Many unnamed patterns also debuted during this time and were later given names by collectors, such as Compass, Yellow Starburst, and Dandelion Duet. As informal get-togethers like potlucks became popular, Pyrex cradles, carriers, warmers and other accessories filled a need for portable products. Expanding beyond the original idea of “Bake, Serve, Store,” your favorite Pyrex dishes could now go from your oven to your neighbor’s table with ease. 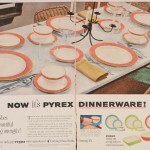 Click below to see larger images of the colored Pyrex advertisements. 1953 – Dinnerware with colored rims in Lime, Flamingo Pink, Turquoise, and Dove Gray debuted. 1955 – Speckled yellow and pink, called Desert Dawn was released. 1956 – The first screen-printed patterns debuted in Pink Daisy and Snowflake, which came in white on turquoise, turquoise on white, and white on charcoal. 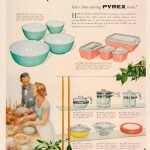 1952 – Lime and Flamingo Pink joined the Pyrex Primary Colors. 1957 – New patterns were added to the standard line named Butterprint and Gooseberry. These patterns were the first to be available in both the traditional style bowls as well as the new Cinderella style, which had a handle on one side and a spout on the other. 1957-1959 – Promotional gift set patterns were released in Black Tulip, Scroll, Bluebird, and Golden. Many unnamed patterns also debuted during this time and were later given names by collectors, such as Compass, Yellow Starburst, and Dandelion Duet. 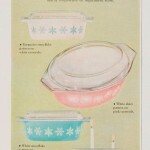 1956 – Pastel yellow, pink, and turquoise joined the solid color bakeware. 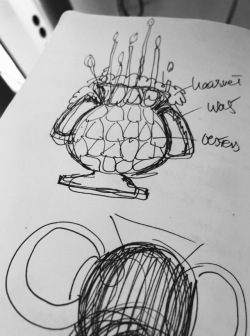 If you’d like to learn more about Pyrex patterns from the 1950s (and beyond) check out the Pattern Library on our Pyrex Potluck website. As a member of the Rakow Library’s Collections Management team, Emily works with the Library’s serials, auction catalogs, and digital collections.